Director David Lynch’s strange and visionary sci-fi epic is given a new lease of life with this unique fan-edit by Spicediver. 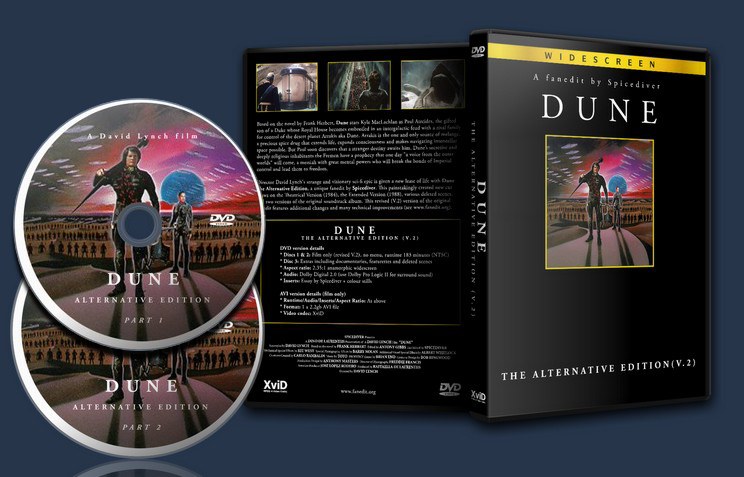 Dune The Alternative Edition is a painstakingly created new cut that draws on the Theatrical Version (1984), the Extended Version (1988), various deleted scenes, and two versions of the original soundtrack album. Presented in 2.35 anamorphic widescreen with Dolby Digital 2.0 stereo sound. The Revised Version 2 replaces V1 and features additional changes and technical improvements. Both of the officially released versions of David Lynch’s visually amazing ‘Dune’ have substantial problems. The Theatrical Version was gutted to the point of incomprehension by executive producer Dino De Laurentiis in his quest to make it a two hour movie instead of three. The easier-to-follow Extended Version assembled for cable TV, with much restored footage, was so incompetently put together by Universal’s MCA TV division that Lynch ordered his name removed from the writing and directing credits. Broadly, my intention with the Alternative Edition is to improve storytelling and flow by preserving the best elements from both official versions of the film while also integrating some newly available deleted scenes. The Alternative Edition does not claim to be a director’s cut. It is also based more on the Extended Version of Dune than several other fanedits doing the rounds. In this and many other respects the Alternative Edition is a significantly different take on the film. I have used Herbert’s novel and the 6th and 7th drafts of Lynch’s original script as a guide but have also taken my own liberties with the material. Thanks to those of you who gave kudos and shared constructive criticisms along the way. 1) MISTAKES. Many of the mistakes exclusive to the Extended Edition have been removed or corrected – such as atrocious editing, the TV censorship cuts, and the silly repeated/fabricated footage used to set up or pad scenes. 2) COLOR CORRECTION. The 40 or so minutes of extra live footage hastily reinserted into the Extended Version by Universal/MCA was never color graded and suffers from color mismatches with the older Theatrical footage. In V.2 colour-correction has been applied to all shots, scenes and part-scenes where the mismatches are clearly apparent, which amounts to about 80% of the extra footage. However the missing “blue eyes” of the Fremen have still not been restored – a massive rotoscoping job I chose not to undertake. 3) PROLOGUE. The painted-stills Prologue from the Extended Version has been fixed to make it a more accurate and more helpful background to the Dune universe. It has been shortened and reconfigured to avoid repetition, to avoid giving away plot points, and to correct confusing mistakes. In V.2 the Prologue has been moved to the very start of the film, before any credits and before Reverend Mother Ramallo’s introduction. In V.2 there are also slight changes to the score and the shot selection. 4) NARRATION. The male narration from the Extended Version was chosen for this edit and most of it has been preserved, while deleting or correcting occasional voiceover mistakes or misuse by the producers. I have always found this narration to be a more persuasive than Princess Irulan’s voiceover from the Theatrical Version. In V.2 the narration has been completely removed from one scene where the Fremen watch House Atreides arrive on Arrakis. 5) MUSIC. The Extended Version of Dune assembled my Universal/MCA is badly re-scored. It inexplicably omits Brian Eno’s ‘Prophecy Theme’ and generally the beautiful score by Toto is used far too often, too repetitively, and at times very inappropriately (eg. action music in a quiet scene). V.1 addressed this problem through restoring Eno’s music and favouring scenes and sequences from the Theatrical Version wherever possible. In V.2 the problem is further addressed by the removal or re-scoring of the music in 6 more scenes. 6) SCENE ORDER. I have restored to their correct place a number of existing scenes that appear in the wrong part of one or both versions of the movie (eg. Duncan & Leto’s reunion, the drowned baby worm ritual that produces the Water Of Life). 7) INTERNAL DIALOGUE. This was used successfully by Herbert in his novel but I believe it was a colossal mistake to adapt this device so literally to the screen. Many viewers including myself found much of it infuriating. In V.1 a handful of removals and edits were done to the internal dialogue, mostly in the dream sequences. In V.2. I have removed or minimized another 14 instances, again mostly without cutting any footage. Overall, the effect is a narrative that gives less away and unfolds more naturally. 8) DELETED SCENES. Some – but not all – of the deleted scenes that appeared as an Extras feature on the 2005 Universal Region 1 DVD release have been integrated into the Alternative Edition. These are rough-looking compared to the rest of the film rest but when edited back in these scenes restore plot points, warmth and character. In V.2 I have also performed some basic color correction on these scenes but the impact is limited given the poor condition of the footage. 9) TRANSFER QUALITY. It was noticed after the completion of V.1 that the Region 1 DVD Extended Print is actually slightly crisper that the Region 1 DVD Theatrical Print. Therefore in V.2 some Theatrical Version footage has been replaced with identical footage from the Extended print, while retaining the Theatrical Version’s superior audio source. 10) OTHER V.2 CHANGES. Restored the destruction of the Weirding Modules; restored establishing shots in several scenes; restored several shots of Paul’s filmbook slideshow; restored and fixed one of the filmbook voiceovers and its accompanying shots. I've been a fan of Lynch's Dune my whole life. I can remember seeing commercials for it when it was first released and being totally taken with the visuals. I was too young to see it in theatres sadly, but a few years later I finally saw it on video. A strange, wonderful, creepy and somehow unbalanced film. Years after I first saw the film I finally read the book and came to understand how far the film had diverged from the source material. SpiceDiver's edit is nothing short of revelatory. The new book structure, the incorporation of extended and deleted scenes bring the film more in line with the book. I loved it. As a fan of both the original film and the novel I have no hesitation in saying that that this is now my definitive version of the film. SpiceDiver has turned Dune from a cinematic oddity and turned it into a film worthy to carry the title Dune. Thanks for reviewing my edit. Sir this is a might fine piece of work and I commend you for it! Thank you so much for making this, it is spectacular! I liked this movie so much since childhood that I play it at least once or twice each months since 20 years ;) and I love what you did with the V.2 version! Your edit gave me a much more complete experience, all these little so important details changed my perspective on many important key points of the story-line. At 3 hours I must admit my trepidation at sitting down and watching this one. But boy, am I glad I did. This Dune edit is a great piece work and a real lesson in the art of storytelling through editing. 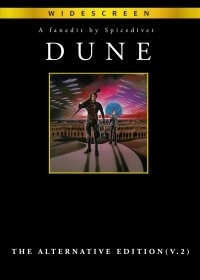 I like the first 3 books although it was the original version of Lynch’s movie that actually got me into Dune. When I first saw it I liked a few elements like the creative art direction but I was pretty annoyed and confused and had to read the novel afterwards to understand what the hell was going on! I’ve watched the extended ‘TV’ edition on DVD a few times and I think its intriguing but I agree with Spicediver: what an amateur mess it is. I really enjoyed the alternative edition. It’s extremely well thought out and technically very nicely edited and mixed. The extra deleted footage is rough, yes but the stuff that was chosen belongs there and there’s not too much of it. Another thing: only after watching this edit did I realize how much of the ‘voiced thoughts’ had been erased from the soundtrack. Then I had flashbacks: god, those voices were annoying weren’t they? So, great call there by the editor: it’s a device that belongs in the novel, not the movie! This is Frank Herbert's Dune as is should have been released back in the 80s. There is a bit of source material that isn't as well preserved as the rest of the available footage, yet its inclusion is most welcome as it helps the narrative greatly.